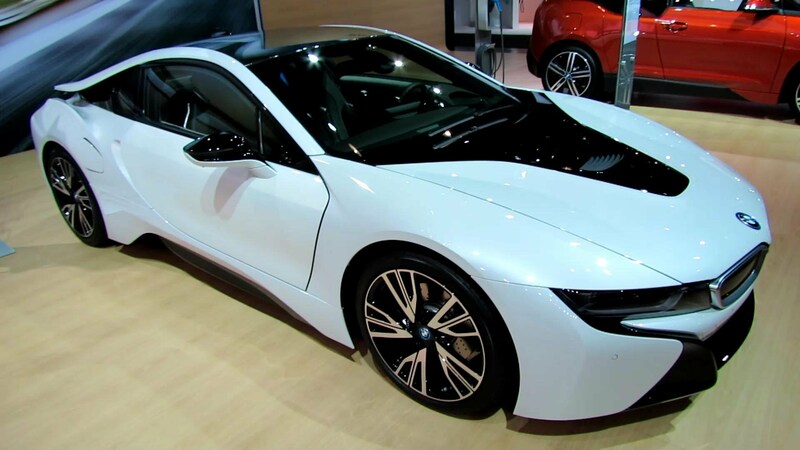 Finally a concept car that can be bought at decent price……BMW i8 – The Hyper Hybrid !!! 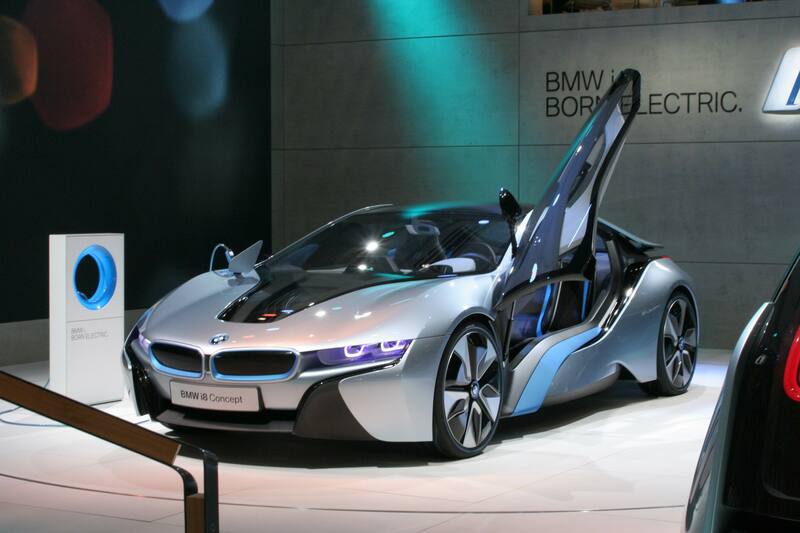 The Good Concept-car looks help the 2015 BMW i8 stand out in the crowd and a carbon fiber body keeps weight down. The plug-in hybrid drivetrain allows 22 miles of electric range and total output reaches 357 horsepower. The Bad Skinny tires lack strong cornering grip and the hybrid drivetrain programming seems in need of refinement. The Bottom Line The 2015 i8 commands a very high price, but it is the most exotic car currently bearing the BMW badge and offers a dual personality between efficient electric and powerful sport driving. The i8 is a sort of hyper-hybrid, what might have happened if Ferrari had developed the Prius. It exhibits two very distinct personalities: energy-obsessed engineer and troubled youth. Driving it in its Comfort and Eco Pro modes, I could have parked and forgotten all about it, but after moving the shifter to Sport mode nothing short of violence was going to get me out of the i8. Hitting production in conjunction with the more affordable and mundane i3, the i8 represents BMW’s radical rethinking of personal transportation in light of climate change issues and shrinking fossil fuel supplies. The i8 seems like a first effort by BMW to bring in new century efficiency yet maintain its performance legacy, and it will cost you dearly. Base price in the US comes to $135,700 before adding any of the available “World” trim levels. UK buyers are looking at £99,845, although the i8’s electric-only mode should avoid congestion charges and preserve the village green. Below the equator, Australians are looking at $299,000 for the i8. The i8 is certainly an extraordinary-looking vehicle, as if BMW built a concept car then forgot to get rid of all the interesting bits before putting it into production. Beyond its concept-car looks, the i8 uses a completely unique drivetrain, bearing no resemblance to even BMW’s own hybrid vehicles. Tucked away somewhere in the car is a turbocharged 1.5-liter three-cylinder engine using BMW’s valve timing and throttle control technologies to produce 228 horsepower and 236 pound-feet of torque, driving the rear wheels through a six-speed automatic transmission. That engine, a variant of that found in the 2015 Mini Cooper, gets a little help from the 11-horsepower starter motor, smoothing over turbo lag. Driving the front wheels, the i8 uses a 129-horsepower electric motor, powerful enough to move the car all by itself when the 5 kilowatt-hour battery pack has enough charge. Oddly, a two-speed transmission sits between that motor and the front wheels. Filling the battery pack takes just 1.5 hours from a 240-volt source, and gives the i8 22 miles of zero-emission range. BMW sets the total power output for the i8 at 357 horsepower and 420 pound-feet of torque, with a 0 to 60 mph time of 4.2 seconds. EPA figures show 76 miles per gallon equivalent, 28 mpg average on the gasoline engine alone. However, as is typical with plug-in hybrids, mileage will vary drastically depending on how frequently the car gets charged up. Further setting it apart from the BMW line-up, the i8 makes use of carbon fiber for its passenger compartment and aluminum sub-assemblies for engine support and chassis. Unfinished carbon fiber was in evidence , a subtle means of calling out the i8’s use of this exotic material. That construction helps keep the weight down, but the i8 still tips the scales at a 3,455-pound curb weight. A couple of simple latches in the cargo area let me gaze at the black metal box containing the battery pack, occupying a mid-body position in the car. A hatch on the left front fender covers a J1772 electric vehicle charging port, while a standard fuel filler sits at the right rear. The i8 uses 2+2 seating, meaning there are padded spaces behind the rear seat where you could put your computer bag or possibly some groceries. A compartment under the rear hatch could have held a couple more grocery size bags. Appropriately for a car from the future, the i8 lit up accent lighting and various screens around the cockpit, but no burst of combustion broke the quiet. In Comfort mode by default, the LCD instrument panel tinted its speedometer and power gauge blue. BMW’s usual rocker switch for drive modes, mounted on the console, only offered Comfort and Eco Pro modes, lacking the Sport and Sport Plus settings of other BMW models. 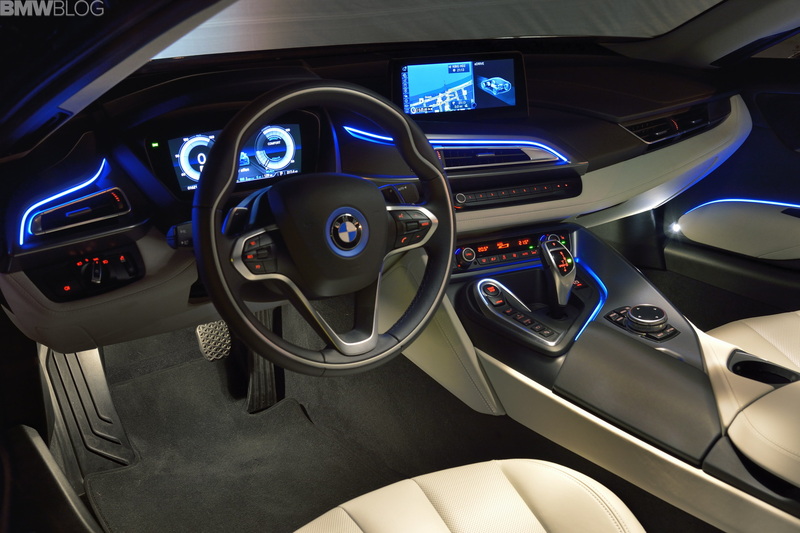 A button labeled eDrive on the console promised to keep the i8 driving under electric power, if the battery would allow it, while the shifter had a pull-to-the-left Sport position. BMW uses the navigation system to look at the road ahead, adjusting the drivetrain power output in advance of ascents. When you consider the two power sources driving different sets of wheels and the two intervening gearboxes, BMW did a masterful job of making the i8 an exceptional driver. The car must match power front and rear, then decide which end needs more torque based on road and driving conditions. The fact that it all works so well can be chalked up as a big win for BMW engineers, and I hope to see the company capitalize on this technical achievement in other cars. This example came with energy-saving LED headlights and a head-up display, projecting vehicle speed and route guidance on the windshield. A camera mounted at the top of the windshield enabled a pre-collision braking system, which also warns if it thought people do not brake soon enough to avoid hitting cars ahead. 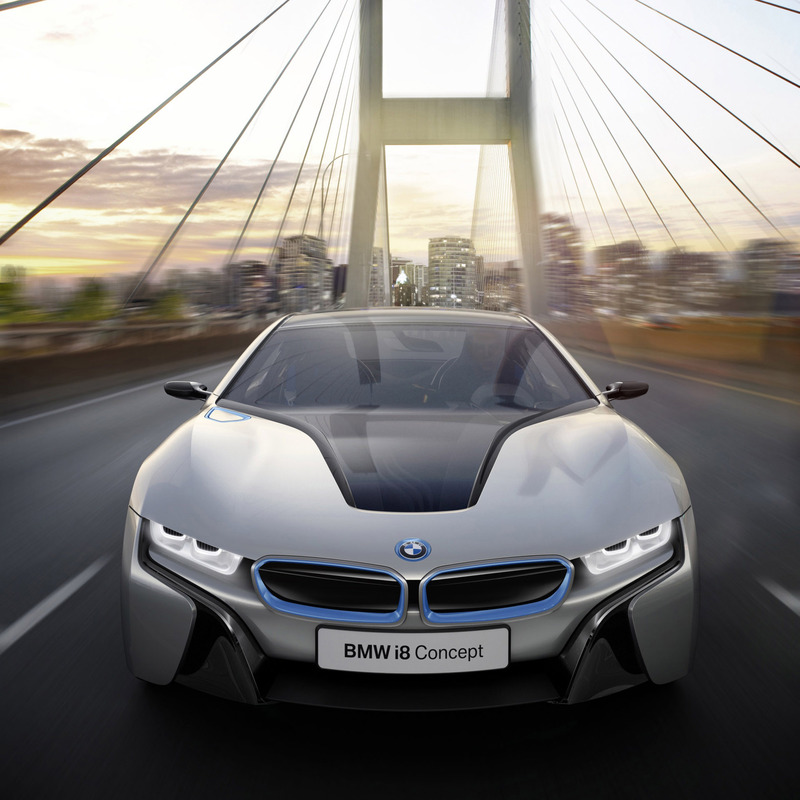 BMW offers a surround-view camera for the i8 to help keep its carbon-fiber body panels unscathed. As I’ve seen in other BMW models, the i8’s cabin electronics are among the best available. Sitting up on the dashboard, BMW’s standard wide LCD shows navigation, stereo and online information, along with a few added screens detailing the car’s energy usage. BMW’s latest iDrive controller, with its embedded touchpad, let you control all on-screen features. Likewise, voice command was present, giving easy control over most infotainment system functions. The excellent navigation system shows detailed maps with extensive traffic coverage, giving route guidance a better chance of keeping the i8 out of traffic jams. The navigation system’s points-of-interest database added a section for charging stations, appropriate for the i8. But when I checked the list it was oddly empty, not showing any of the many charging stations I know exist around San Francisco. BMW offers a very good set of connected features, including online destination search and third-party apps. Some of these connect through the car’s built-in data connection, and some rely on the BMW ConnectedDrive app for smartphones. This app is fully functional for iPhone, but the recent Android version seems to lack many of its counterpart’s features. I have been extremely impressed by BMW’s online features in cars such as the M4, but none were working in this i8. BMW assures me that all of its connected features come standard in the i8, which I would expect for such a high-priced and futuristic car. In addition, the i8 gets a telematics system letting owners check the charge status from a smartphone app. The i8’s own head unit showed me different charging options, such as the ability to take advantage of low-priced electricity in the earliest hours of the morning. Audio sources ran the full gamut of what I’ve seen in other BMW models, from an onboard hard drive to HD radio. That music library interface, identical to that used for devices plugged into the car’s USB port and the onboard hard drive, still suffers from an over complicated design. It takes far too many button pushes to find and play music. 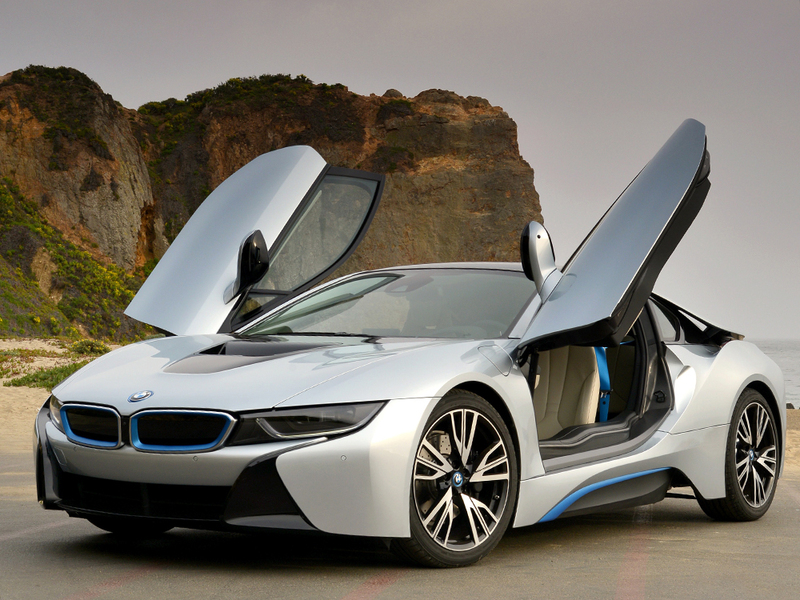 Music, and the engine note, plays through a Harman Kardon audio system built for the i8. Featuring 11 speakers and a 360 watt amp, you can enjoy listening to music in the car, although the quality may never rose to truly sharp audiophile levels. 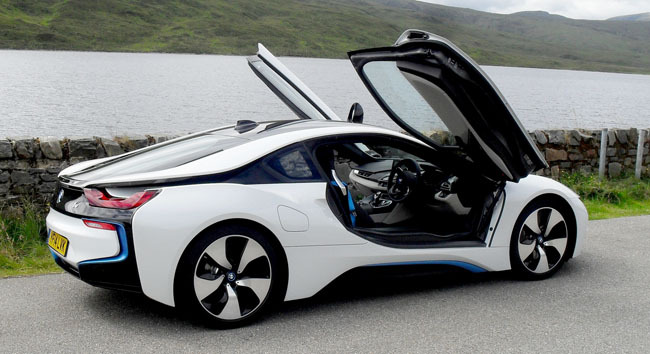 The 2015 BMW i8 is an extraordinary technical achievement. Although pricey, it is near the cheapest car you can get with a full carbon fiber body. Its look is pure concept, and much more interesting than its sibling, the i3. Although I found some odd issues with its fuel economy, this plug-in hybrid system impressed me with its power control. Most impressive was the i8’s Sport mode, which made for a surprisingly different ride. I’ve noted and appreciated the dual nature of previous BMW models, especially those bearing the M, but the i8’s personality split is so wide that it deserves two model names. BMW hasn’t played up its connected car features much, but they are impressive, as is its cabin tech. The i8 comes with the latest iDrive system, featuring excellently detailed maps and very functional voice command. The connected features, although not working on this example, make online destination search quick and easy. Integrated apps offer online music and safe social media status updates. 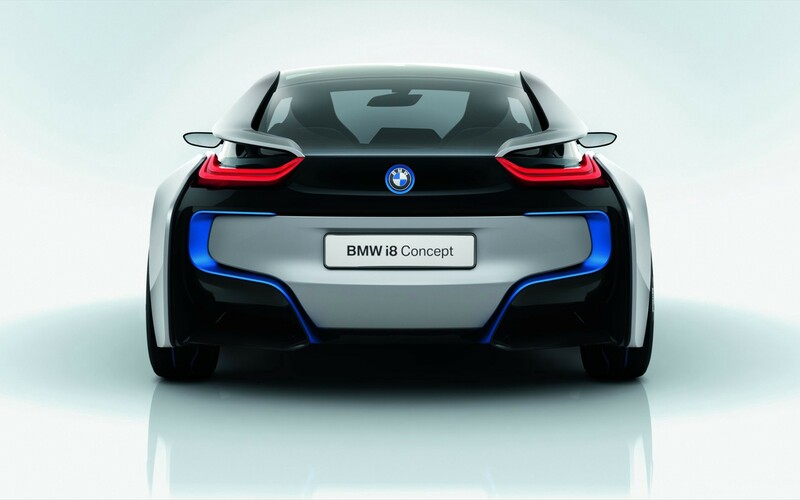 If the i8 represents BMW’s future, the company is already years beyond the competition. 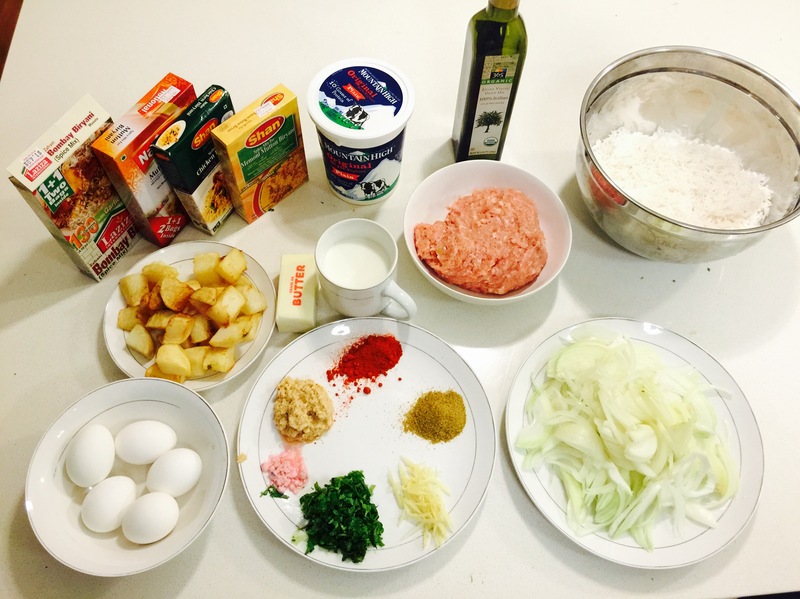 Lets Start with the rice preparation. 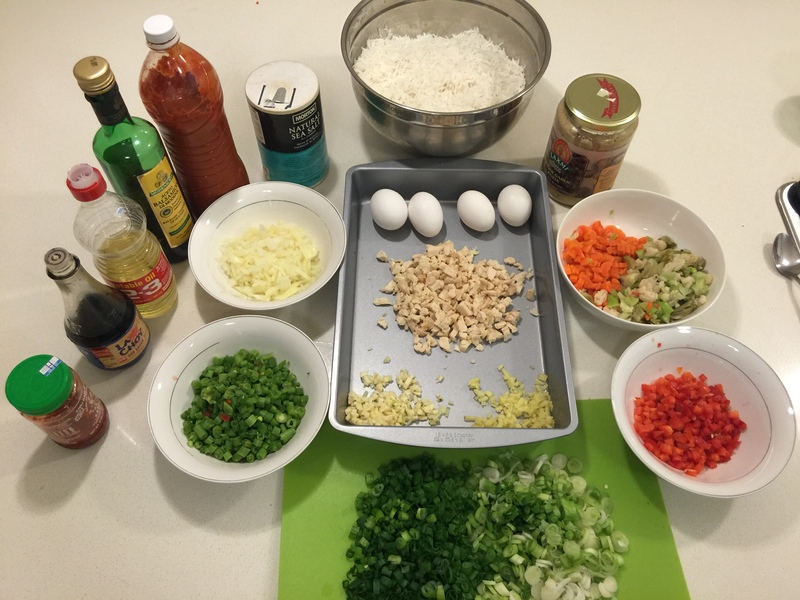 Its important to make sure you do not undercook or overcook your rice as this will make or break your recipe. Wash the Basmati rice 3 times making sure you remove any dirt and impurities. Now in boiling water add some rose water(optional) and salt. Drain the rice when cooked 70%. In a bowl add curd with coriander powder, red chilli powder, ginger garlic paste and salt. Mix well and keep it aside. In a hot pan add the biryani spice mix and roast it for few minutes. Grind the mixture and keep it separately. In a cooking pot add some oil and once heated add onions to it. Until the onions are golden brown go ahead and add the curd mixture to it. Stir it and Let the oil separate. Now add the chicken mince to this mixture and stir well until it thickens. Add little water and stir for 5 more mins. Add little salt and the spice mix and stir well. Now go ahead and add 1 cup of milk and cook for 10 mins. Keep this mixture aside. In a separate pot add some butter and add half of this mixture. Then add the rice followed by some fried potatoes and boiled eggs. Add the remaining gravy on it and add the rice again. Add some ginger julienne and chopped coriander leaves and some more fried potatoes. you can also add some mint leaves (optional). 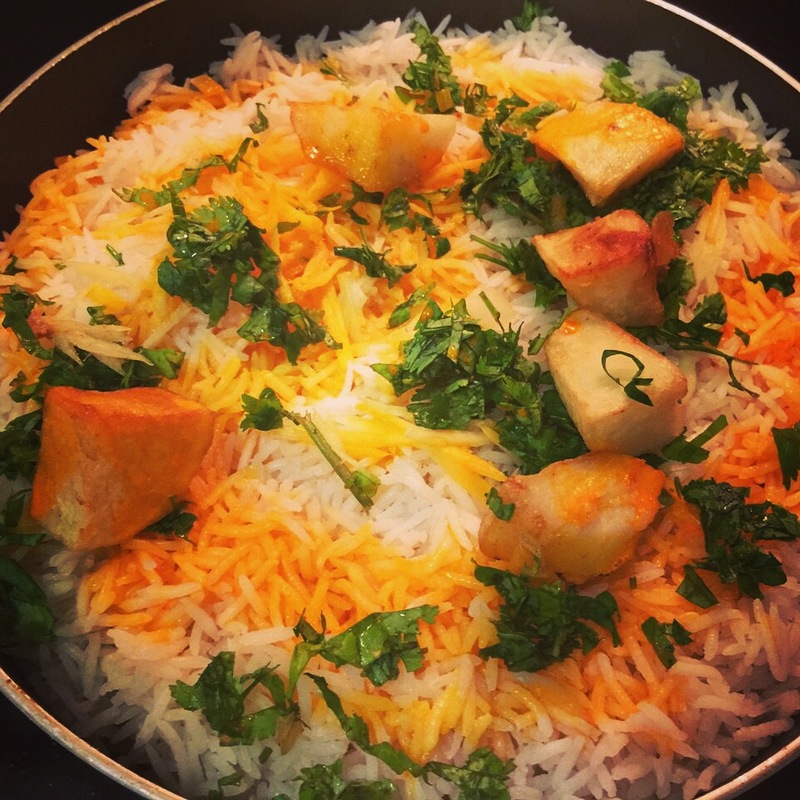 To give more flavor, mix some saffron in warm milk and add on the rice evenly(you can also mix food color with milk and add). Bonus Tip: Add some Roasted cashews or almonds to get a rich taste. You can use Lamb or Beef Mince too and it will taste equally awesome. 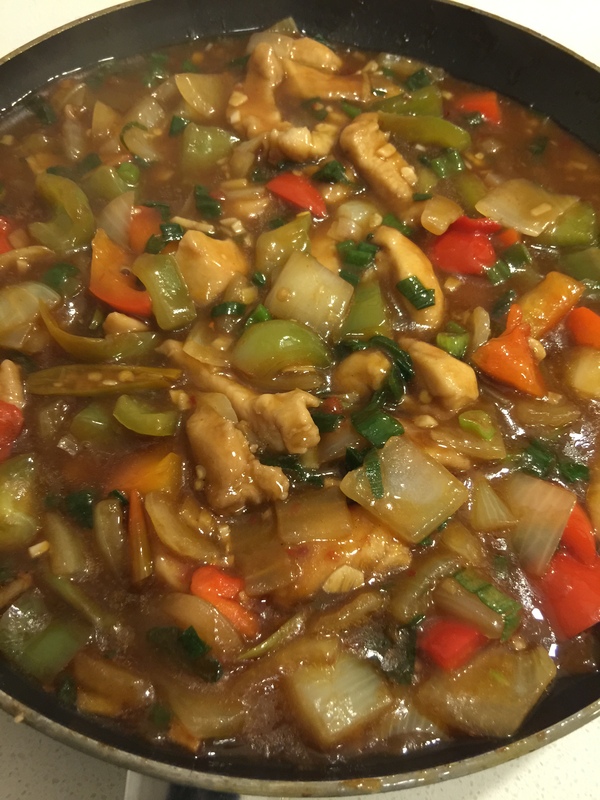 Takes Chicken Cubes and add some soy sauce, salt and cornstarch or cornflour and mix. Deep fry this batter for 4-5 mins and keep it aside. In a wok, add some oil (keep it at high flame), followed by chopped garlic (lots of them), chopped ginger, Green chillies, Diced onions, Bell peppers. Stir it nicely. Add some chilli garlic sauce or paste. Add Schezwan sauce(optional) or Chilli sauce and some soy sauce. Stir well. Add Green portion of Spring Onions, Chicken (that were deep-fried and kept aside). Add some water (mixed with some hot or chilli sauce). Add salt according to your taste. Add Some cornstarch or cornflour mixed in water(just half a cup to give consistency to the sauce). Top it up with some more spring onions if needed. Enjoy this recipe while its hot on its own. 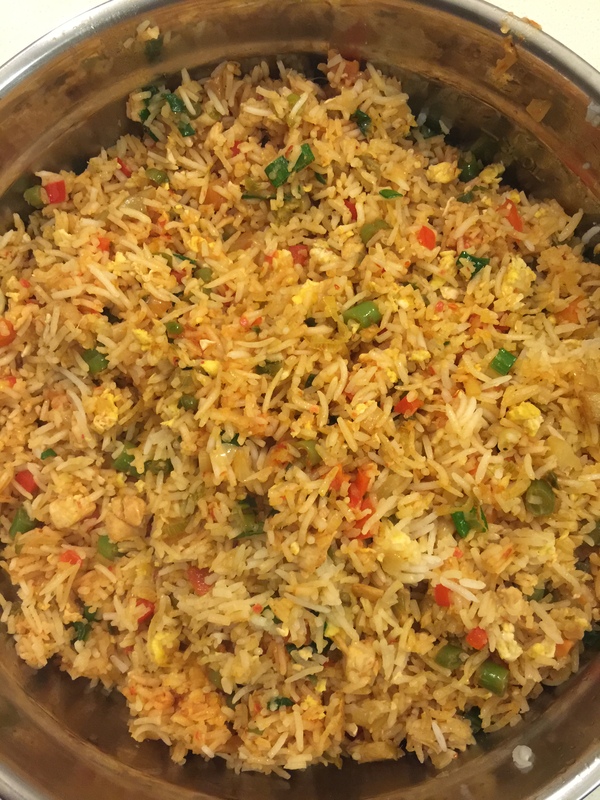 Goes best with Chicken Schezwan Fried rice or rice. You can use green chilli paste or sauce to give a nice chilly flavor to the dish. While mixing chicken with cornstarch and soy sauce, add an egg to it (this will help bind the mixture even better and enhance the taste). Add some oil in a wok or pan, make sure it’s on high flame as this is a Indo-Chinese dish and requires cooking at high flame. Add chopped ginger & garlic with half tsp of ginger garlic paste (this will add flavor to the vegetables while the chopped ginger/garlic will give direct flavor to you). Add the onions, spring onions(white & light green part), bell peppers, carrots, cauliflower & Stir well for 5mins. Add little salt (this will help to cook vegetables quicker). Add some vinegar(white or balsamic), soy sauce(black) and schezwan sauce(you can increase or decrease the quantity of this sauce in accordance to how spicy you want it to be). Give it a nice stir and add the chicken. In a separate pan add eggs and some black pepper, stir it till you get scrambled eggs (2-4 eggs depending on how much you need). You can skip adding salt as the schezwan sauce has enough salt. Add to the mixture to the wok and mix. Lastly add the cooked rice (80% cooked). Toss nicely and garnish with the remaining spring onions. In a wok add some oil, add chopped garlic(20nos), chopped ginger(2inches). Stir well for 3 mins at medium flame as you want to take away the raw flavor of garlic. Add Red chilli paste or (grind the red chillies soaked overnight and use them). Stir it well and add some water (just 4-5 tsp to make it more smooth). Add salt & pepper powder. Lastly add little vinegar and soy sauce. 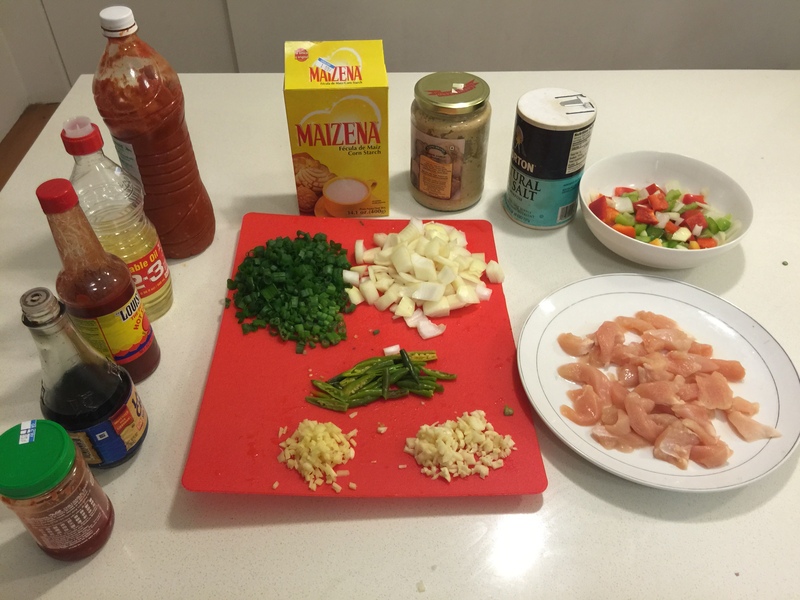 You can also add chilli sauce or tomato ketchup (this is optional-it will give more flavor to the sauce). Cook for about 5 mins in medium flame. Schezwan sauce is ready. Bonus Tip: You can add green chilli sauce after adding soy sauce to Schezwan rice preparation. This will give a more spicy and enhanced flavor. P.S: Just in case you feel too lazy to prepare the schezwan sauce, you can buy it online. I have attached the link to it in the ingredients section above. Also for chilli sauce you can either use Sriracha hot sauce or any other hot sauce you may prefer. Add chopped onions to the mince chicken, followed by coriander leaves, garlic, ginger, green chillies, cardamom powder and dried mint leaves, white pepper powder, garam masala, chaat masala, salt to taste, little bit of oil and finally some butter. Mix the above batter well to form a thick paste, add lime juice and mix well. 4. 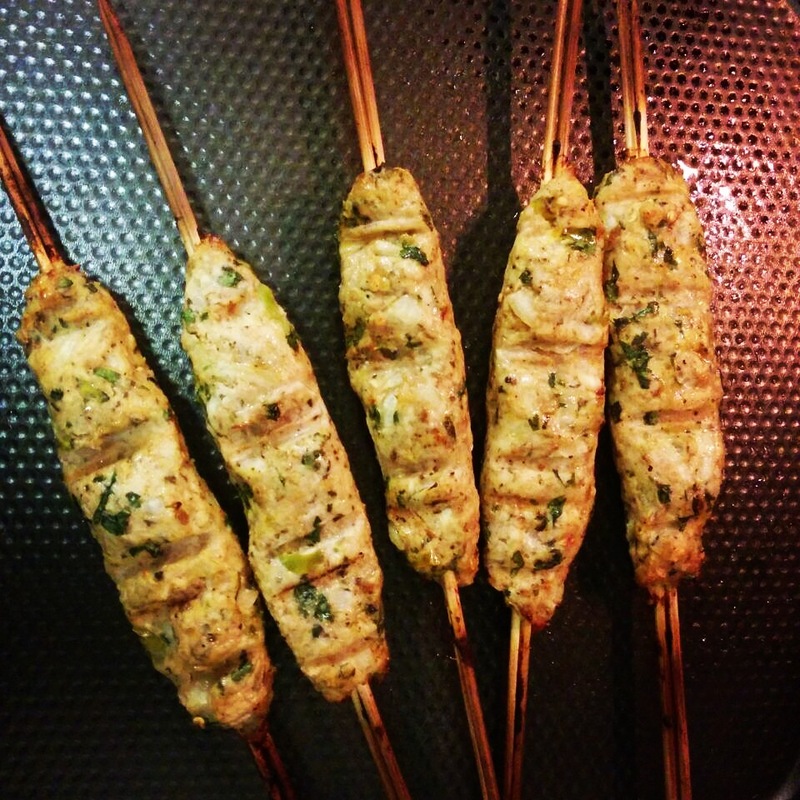 Pre heat the oven to 400’F and place the skewers into the oven for 20-25 mins until light golden brown. 5. 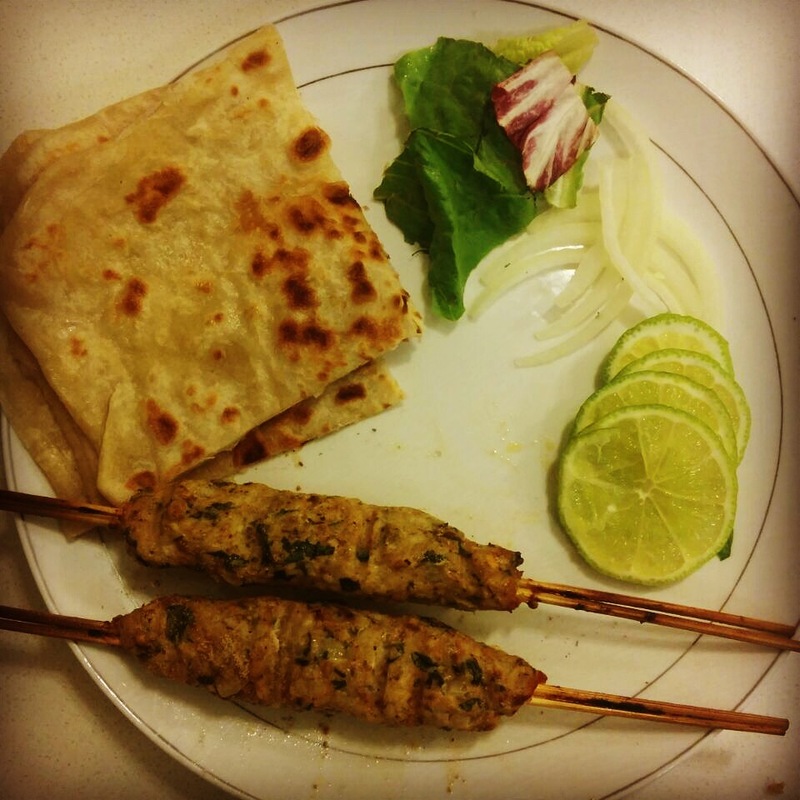 Remove the kebabs from the skewers gently and serve with naan or rice. Bonus Tip: Add some shredded cheese (laughing cow, cheddar or any other cheese) in the batter and mix it. This will add a cheesy flavor to the Kebab. Do give your feedback & comments. Don’t forget to share this recipe with your loved ones ! 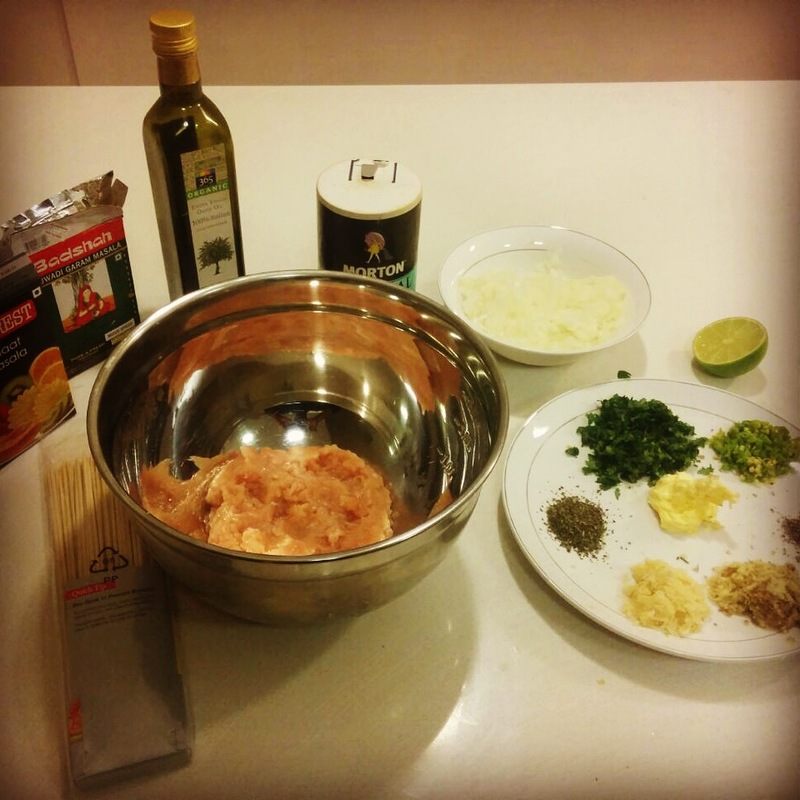 P.S: If you cannot find the ingredients mentioned above, please click on the hyperlink provided in Ingredients section. Also you can find these specific spices at any nearest asian store. Feel free to ask anything you would want to know more about these spices.